Australia’s weather bureau on Jan 12 has cut the forecast strength of a cyclone bearing down on the continent’s far northwest on Friday and dropped its warning for high winds at iron ore terminal Port Hedland. Cyclone Joyce, a Category 1 storm, is holding just off the beaches of Pilbara iron ore belt, prompting the overnight closure of the world’s biggest iron ore export terminal at Port Hedland, 1,700 km (1,050 miles) north of Perth, as a safety precaution. “Port Hedland has been taken out of warning status, with winds easing as Joyce moves inland,” the weather bureau said in a tweet. The port accounts for over half of Australia’s iron ore exports, handling more than a million tonnes a day from the Pilbara iron belt, the majority bound for Chinese steel mills. A new cattle loading ramp at the Port of Port Hedland is now fully operational and ready to take its first shipment of cattle. 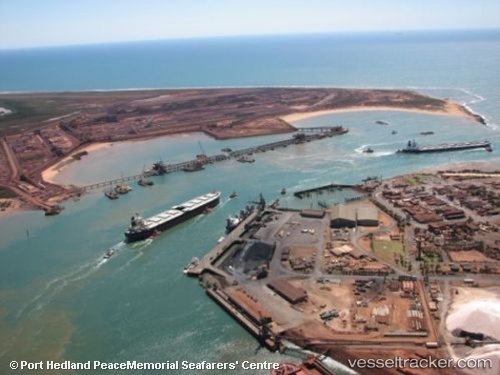 Landside Operations Manager, Jon Giles said that although the Port of Port Hedland has always had the capacity to ship livestock from the port, the cattle loading ramp would provide an improved and more efficient operation for port users and livestock. “The new loading ramp will enable cattle to be offloaded from both the top and bottom levels of a cattle truck simultaneously, making it a faster process for customers as well as being a safer way to transfer the livestock from truck to vessel.